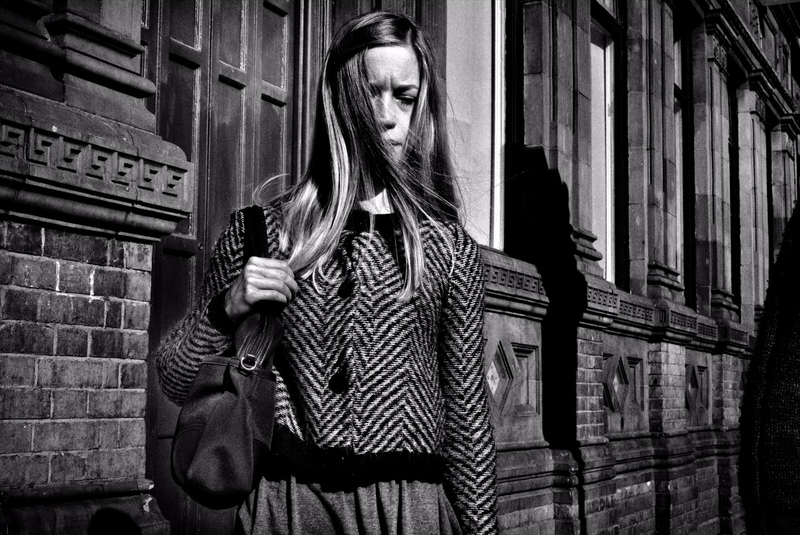 Eamonn Doyle’s second photo-book, ‘ON, follows last year’s ‘i’, a collection of street portraits from Dublin city centre. In ‘ON’, black and white figures stalk across Dublin streetscapes, by turns lost, menacing, wary, browbeaten or entranced – but always at odds in some way with their environment. The figures are dynamic – muscles taut, heads in mid-turn, bodies in motion. Some flee the photographic gaze itself. Others stare challengingly down the barrel of the lens. Most appear caught up in projects so intensely private that they have an air of total inaccessibility. Rarely does the photographic act intrude so little on the lives of its subjects. Paradoxically, the energy is sought at precisely those moments when the unruly subjects look most likely to tear the images asunder. ‘ON’ opens out to history more directly than its predecessor. Whereas ‘I’ was preoccupied with figures consumed by introspection, the dramas in ‘ON’ are far more environmental. Dublin’s hermetic seal has cracked open and the rest of the world has somehow spilled in. These subjects are photographed mostly from the front and from a lower angle. It’s a presentation that opens out their world, contextualising them by placing them against an architectural backdrop. Where the mysterious, often faceless figures of ‘i’ were often flattened against their worlds, the subjects of ‘ON’ stand out and strike out against their environments, often looming against skies in a way that speaks of possibility, even as they nurse wounds or eye each other suspiciously. Gallery representation: Michael Hoppen Gallery, London. Born in Dublin in 1969, Eamonn Doyle graduated with a Diploma in Photography from IADT in 1991. He spent much of the next twenty years producing music and working in the independent music business, founding the Dublin Electronic Arts Festival (DEAF) alongside the record labels D1 Recordings and Dead Elvis. He returned to photography in 2008. His debut photobook i, described by Martin Parr as ‘the best street photo book in a decade’ was published in March 2014. Most of his work is produced in and around the Dublin city centre location where he has lived for the past 20 years.